Let me start off by saying that Free Technology 4 Teachers shares some of the best resources for teachers, no matter what subject matter you teach. Free Technology for Teachers is the project of Mr. Richard Byrne; which you can follow on Twitter, and I highly recommend that you do so. Mr. Byrne is a Google Certified Teacher and has been posting Technology for teachers since November of 2007. Is it a coincidence that I started this blog in November as well? Hmm...probably not since my started 2 years later, and that is beside the point, since Mr. Byrne was an inspiration for my blog. Now, why is this site a Must See...well, it is really more than a Must See, it is a Must Follow. So far 15,000 other people do. 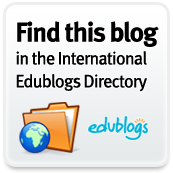 Daily post about Web 2.0 and other technology resources that teachers can use; and every single post I have read has always been free...hence the title of the blog. Over 2600 post to date with technology related resources. Do the math...that is over 100 a month! Man, and he does all this on top of teaching...Kudos! 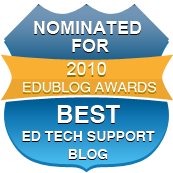 Free Technology 4 Teachers was nominated and won The Best Resource Sharing Blog and The Best Individual Blog in the 2009 Edublog Awards. That makes him a Repeat Champ since he won The Best Resource Sharing Blog in 2008 as well. You can Become a Fan on Facebook as well...and let me give Mr. Byrne credit for giving me the idea to create a Fan Page as well for this blog. Any links he adds go to a Favorite List that he has created based on the resource in each post. So find your subject matter and see what can help you in your classroom. While typing this post, Mr. Byrne typed another post about technology. Keep up the great work for all the educators out there! I agree, Free Tech for Teachers is a must follow for educators. I don't know how he manages so many posts a day...I have trouble keeping up with them all, but boy do I love trying! Does Your School Tweet? They Should! !